They don't last as long as claimed. LED's or Light Emitting Diodes have been around since 1962. Originally used for indication purposes rather than illumination. The latest development of high power LED's for projection created the small pocket portable market. Using Red, Green and Blue (RGB) solid state LED's they are limited in brightness (40-300 Lumens) and suitable for small screen projections. Small compact portable RBG LED projectors are now available with up-to 1000 lumens but this is still substantially below the 2500 minimum expected by most business professionals. The problem lay with the Green LED's not being able to produce as much light as the Red and Blue. To increase the brightness to this level manufacturers had to develop a Hybrid Laser/LED powered system. This Hybrid system replaced the Green LED with a Laser. Green Lasers were also too weak to produce enough light so a blue laser sent through a green phosphor filter. This system has now been adopted by most manufacturers and has increased the light output substantially. 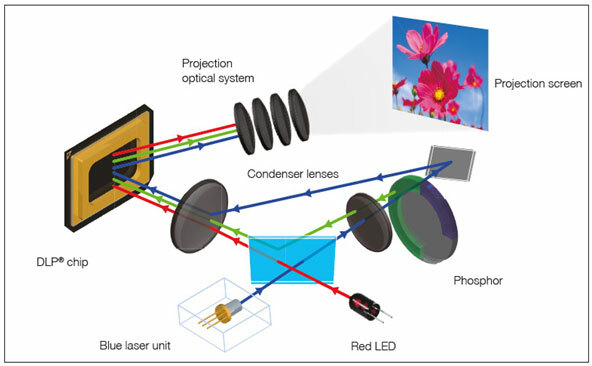 Solid state projectors do offer benefits. They are a more robust light source that can take more knocks than a lamp and if 24/7 operation is required will save on maintenance costs. LED projectors also offer the convenience of near instant on off, with no need to let the lamp heat up or cool down, but there are drawbacks too. We would like to correct some of the misinformation that manufacturers would have you believe. 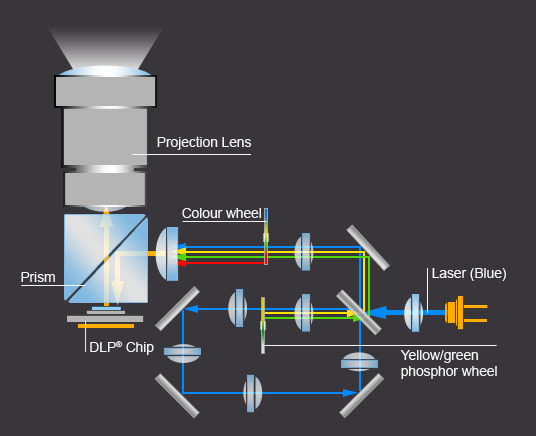 Laser/Phosphor systems include the Solid State Light Source combined with phosphor to produce images that adhere to the SMPTE color space. RGB laser on the other hand, uses the so-called ‘pure laser’ technology. Here red, green and blue lasers deliver the light directly. The product of this technique is an absolutely pure colored light that is split into the three channels. The light is emitted in a very narrow band in discrete frequencies. This makes it possible to realize a color space that reaches BT2020 therefore exceeding even that of Adobe RGB. 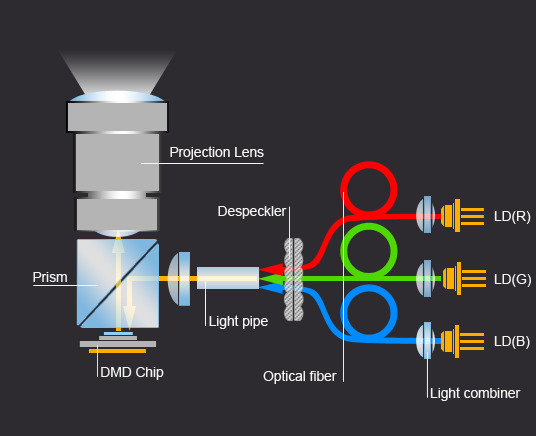 RGB (Red, green and blue) laser is the only true “pure laser” which produces the BT2020 color space using only lasers without the need for additional components such as LED or Phosphor. Most of us would think about an LED projector for one of two reasons. This is the main attraction of LASER / LED's, most solid state projectors are quoting 20,000 Hours (some quote 30,000 for the same LED's?) But what's the truth? The latest independent consumer watchdog research published in the UK Daily Mail newspaper 2014 (open pdf) has found that more than a quarter of LED lamps did not reach their quoted life of 15000 hours. Some even fail to reach 6000 Hours. 66 out of 230 samples failed before 10000 hours. These LED lamps are the same technology used in the LED projectors available. The difference is that in projectors they are run at even higher power to increase the brightness. This reduces the operational hours further. 20000 hours matches the expected life span of the DLP panel inside the projector. This compares to 10,000 hours for the highest conventional Lamp life quoted. When choosing a projector what needs to be remembered here is that when the LED projector reaches 20,000 hours it must be thrown away - no replacement lamps are available. In comparison an inorganic LCD projector offers the longest panel life (20,000+ is quoted) and can have a new lamp added when required. What isn't highlighted is that the 20,000 hours life is a half life, While this has always been the case for normal lamps as well, with a Lamp driven projector when the brightness drops you replace the lamp. Hey there we go full brightness again and you can do this may times if you buy the right machine (sales can help you with this). 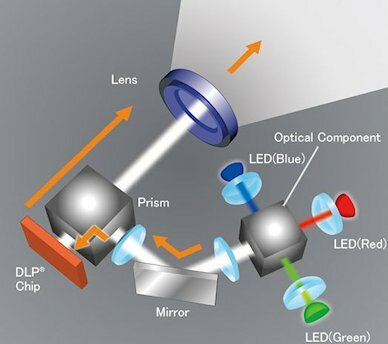 With a Hybrid projector because of the complex light system, changing it is not an option the cost is too high. So in the bin it goes. Initially manufacturers advertised hybrids as constant brightness for the life of the projector. But the truth is that the brightness drops off. At 10,000 hrs the brightness would be 75% and would be 50% at 20,000 hours. The claim that LED projectors are environmentally friendly is debatable. LED's are Mercury free, which is very good for the environment. But after comparing projectors in our database, LED projectors are generally less efficient, using more power to produce the same brightness. While many of us expect the opposite because of our experience of LED lighting used in houses. This reflects in the operating costs, being more expensive to run than traditional projectors (comparison below). *NOTE the above comparisons are for individual machines, not averages. It is to show that if power consumption is an issue then there are better options than LED. Unfortunately we would love to say all is well and good with solid state projectors, but there are issues. A number of LED projectors have had issues in producing consistent brightness. Not so long ago a range of high lumen machines had to be removed from the market because each time the projector was booted the lumens would vary. Varying from 3500 lumens to 2000 lumens. One of the main problems that had to be over come to make high light output LED's was the amount of power needed to produce substantial Lumens and the subsequent heat produced. The heat can substantially affect the consistency of the LED to produce a constant brightness. It remains to be seen that this issue has been solved, especially on the budget models. It can also be said that the higher the brightness of the projector the more detrimental to the LED's performance. If we consider the colour, we are told hybrids produce a large colour gamut, larger than other projection systems. This has always been an objective of manufacturers to increase the colour gamut (more colours). While a large colour gamut is good, it has to be implemented correctly and show an improvement for the viewer. While we see a big difference between the high end LED projectors and the budget machines. Neither offer the more accurate colour of 3LCD projectors. LED projector colours tend to be over the top and in your face, not what you will see in the normal world. Fine for Data presentations but not for Home cinema, Art, multimedia and photographic installations. We expect this to improve as the technology develops. So LED'S loose colour output but while the Laser wont deteriorate as much over time the organic phosphor filter will degrade. How this will affect your image remains to be seen. A lamp system will also suffer a drop but a linear drop in each colour. We can see the LED projector is $600 more. The traditional projector offers 5,000 hours replacement Lamp costs $307. So 2 additional lamps can be bought with the cash saved from the initial purchase, giving 15000 hours of operation. So while the initial purchase of the LED projector is dearer it offers a 30% improvement in Operating hours for the same price but the traditional projector has the potential of a longer operating life. While we recognise the advantages of LED projectors for being solid state and more robust for mobile presentations, the advantages of long life and less power have to be questioned along with the image quality over time. We also wanted to point out here that the system isn't the holy grail of projection.